Firefighters in New Delhi, India, have got a new job: battling air pollution. The country’s capital region is constantly suffering from air quality issues, but things have gotten particularly bad again recently. Some parts of the region were reading air quality indexes over 500, which is as high as the scale is supposed to go. Scores of over 300 indicate pollution levels that are hazardous levels for anyone, healthy or not. In response, federal authorities have directed firefighters to shoot a little water from tall high-rises to help “settle dust and stop garage fires,” reports the Associated Press. Construction activity in the area also came to a forced halt to help prevent the air quality from worsening. Indian officials ordered workers to leave sites covered to keep dust from moving, as well. And diesel vehicles older than 10 years of age need to stay off the roads. The government is taking severe action because this sort of pollution is no joke. All this particulate matter can enter and damage the lungs when inhaled, eventually making its way to a person’s heart. India’s air pollution problem is estimated to shorten lives by an average of 3.4 years, per a 2016 study. The pollution comes from a variety of sources. There’s temporary construction, sure, but vehicles contribute much more. So do industry and crop burning from rural farmers. 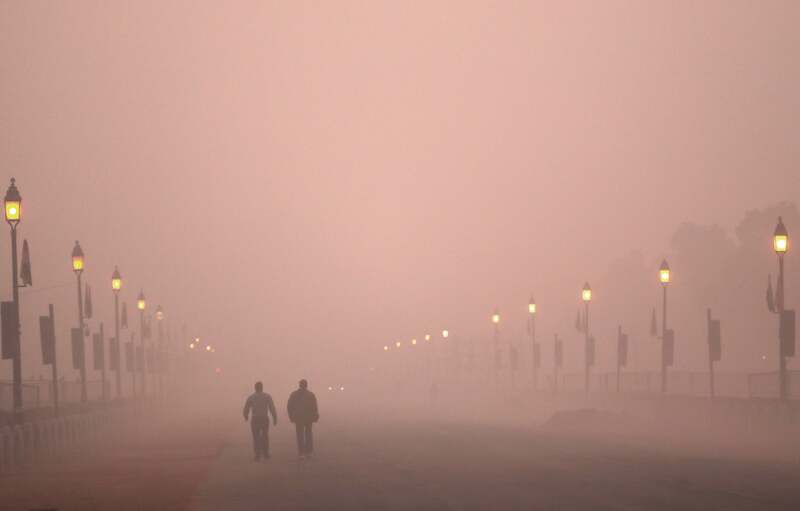 The geography and dry winter climate conspire to cause pollution to become trapped, covering the city in a thick blanket of smog. The government finalised a National Clean Air Programme last year to help solve this health crisis. The strategy sets targets to reduce air pollution by 20 to 30 per cent by 2024 compared with 2017 levels. It calls for more air quality monitors and a close partnership between the federal government and states to develop plans to improve local air quality. Let’s hope the government figures this out and causes portable oxygen tanks to become a fashion statement of the past.